To let you know that the HA response has now been forwarded with all the other responses to the Secretary of State, for independent examination. We have requested to be represented at the examination in public to be held later this year. See our response as submitted to the SoS here. “The Neighbourhood Forum will plan and implement arrangements to create a successor body to oversee the implementation of the plan throughout the plan period. would also initiate and manage the implementation of the community policies and projects by working with the local authorities and other stakeholders and the Headington community. As the Plan is a living document there will be the need to regularly consult local people on implementation issues such as the development of new projects. There is a range of options for the form of the successor body, for example a charitable body such as a community trust, or a statutory body such as a community council similar to a parish council. So the establishment of a Community Council to carry forward the work of the Headington Neighbourhood Forum and to implement the policies and projects of the Neighbourhood Plan has been a key policy of the Plan from the outset. The Community Council would be identical to a Parish Council with statutory authority. Therefore, the Steering Committee, with the help of Headington Action, applied to the City Council to undertake the required first step to establish a Community Council, namely a Governance Review. On 13th February 2019 the City Council unanimously agreed to carry out a review, which is expected to take place from April to June. This is essentially a consultation exercise to confirm that a Community Council would be suitable for Headington. If the outcome of the governance review is favourable elections for the Council would be held in May 2020. The area will need to be divided into a small number of community/parish wards, probably about four, with a small number of community councillors elected from each ward, possibly four per ward. The actual warding and number of councillors is to be determined by the City Council, with input from the Forum. The benefits of a Community Council include a statutory right to be consulted on planning applications with greater influence on the future development of Headington and it would also protect and implement the Neighbourhood Plan and strengthen the identity of Headington. It would raise money for local projects through a small additional charge on the annual Council tax and it would provide a voice for Headington and encourage local people to participate in decisions about our future. Oxford currently has four Parish Councils: Blackbird Leys, Littlemore, Old Marston, Risinghurst & Sandhills. As mentioned above, each Parish Council is funded by a small additional charge to the Council Tax. We do hope members of the Forum will take part in the consultation exercise. Details will be set out in a pamphlet which will be delivered to all households in Headington in April. Planning permission was refused yesterday (19 June 2018) for the third application for the site of the former Quarry Gate pub as it “fails to relate to the strong sense of character of the surrounding area”: Headington Neighbourhood Plan cited. See the Planning Application and Decision. The Headington Neighbourhood Plan comprises both Planning Policies that are taken into account in planning applications and Community Projects (see AGM Agenda for priorities) that the Neighbourhood Forum wishes to promote or develop itself. Since the five-year life of the Forum is nearing its end (March 18th 2018) the next AGM (11am Saturday, March 10th 2018) will consider both the renewal of the Forum and collaborating with Headington Action to take the Community Projects forward. UPDATE: The City had informed us that the official start date for the Forum was 10th September 2014, the date of the relevant City Executive Board Meeting meeting rather than the date of the first Forum meeting, so redesignation will be applied for in 2019. At a full meeting of Oxford City Council on Thursday 20th July 2017 the Council resolved that the Headington Neighbourhood Plan be made. This is the final decision in this lengthy process. The Plan was described by members as “trail blazing” and they warmly congratulated everyone who had worked to bring this about. Are you in the Headington Neighbourhood Forum Area? Check the map or street list. 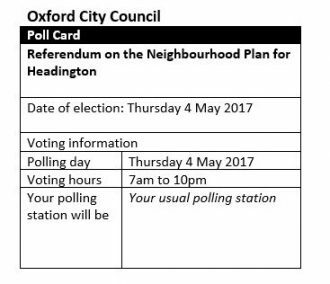 At their meeting on March 9th 2017 the City Council Executive Board warmly endorsed the Headington Neighbourhood Plan and approved its progress to a referendum to be held on May 4th 2017 coinciding with the local elections. Members complimented the Neighbourhood Plan Forum for its achievement in being the first in Oxford to produce a Plan. Chair, Mike Ratcliffe and Vice Chair, Patrick Coulter were present and answered questions from members including the development of a successor body to the Forum. See the Forum’s stall at the Headington Market, Saturday 29th April. See the whole Plan and leave comments here. Oxford City Council’s public consultation on the Draft Neighbourhood Plan (required by legislation) has now finished (on 7th October 2016). The mainly text version of the Draft Plan submitted to the Council is available here. A more user-friendly pictorial version is available here. (Note: minor edits on 26/09/16 and 06/10/16). Oxford City Council has now appointed an examiner to consider the submissions to the consultation and will report in the near future – the date to be announced. The Examiner and City have identified various amendments, to be reported to the Forum on 8th Feb 2017. At their meeting this evening the City Council Executive Board approved the draft Headington Neighbourhood Plan for formal consultation. Following the six week public consultation the Council in association with the Forum will make any necessary amendments and arrange for an independent external inspector to examine the draft Plan. If the inspector confirms that the Plan is satisfactory it will be the subject of a public referendum programmed for May 2017. At the meeting Councillor Alex Hollingsworth who is the Board member responsible for Planning warmly commended the work of all those in Headington involved in preparation of the Plan. This was echoed by Councillor Bob Price (Leader) who praised the quality of the draft Plan and supporting documents. The Draft Plan was commended by City Councillor Mohammed Altaf-Khan while County Councillor Roz Smith attended in support. Vice Chair of the Forum, Patrick Coulter, who attended for the Forum, took the opportunity to thank the officers for their support over the past two years and the Board for arranging the special meeting so that we could meet the May referendum deadline.